Small town in a big city. Grab a passport at local businesses and get ready to get a bite of St. Johns! Sample delicious dishes & drinks at St. Johns businesses from April 5-15. Purchase $5 specials and get passport stickers. Purchase additional food & drink items and get bonus stickers. Turn in your passport by close of business on April 17th for a chance to win $100, $50 and $25 gift cards to your favorite local businesses! Find a list of participating businesses here. Thank you to our sponsors: Big Kahuna’s BBQ & Catering, Block Bikes, Bluebird Tavern, Dehomis, McMenamins St. Johns Theater & Pub, JR Simplot Company, The Ranger Tavern, Pizza Wings & Rock ‘n’ Roll, Urban German Grill, Venture Portland and Your Inn Tavern. The campaigns must be running because we’ve had several new bookings and way more traffic to our site over the last few days, so thank you!! Oregonians CU Fundraiser for St. Johns! Use Oregonians Credit Union and help the St. Johns Booster get a new marquee sign! The St. Johns Boosters have successfully replaced one Marquee sign and hope to replace the other two. In an effort to help raise money for the project, Oregonians Credit Union will be running an auto loan fundraiser. For a limited time, Oregonians will donate 1% of the balance of your new auto loan to the marquee fund. This offer is valid for new or used auto loans, as well as the refinancing of auto loans not currently with Oregonians CU. Make sure to use the offer code STJOHNS. Clock in the St. Johns Plaza. Photo by Deanna Cantrell Photography. Also called the St. Johns Business Boosters, the Boosters work to encourage small and large businesses in St. Johns through advocacy, education, and networking. We make St. Johns shine each holiday season by lighting up our street trees, encouraging shoppers to come out and enjoy our restaurants and boutiques. Each member business is highlighted with their own page under either Art + Artists, Eat + Drink, Shop, or Services. Check the pages for details including hours, location, and links to social media. Look under Events to learn about scheduled activities, street fairs, and St. Johns Boosters meetings. Whether you are new to St. Johns or a long-time resident, we appreciate your patronage! The St. Johns Bridge is one of the gateways into St. Johns, a small town in the big city of Portland, Oregon. Incorporated in 1902, St. Johns is the walkable northern neighborhood of Portland, Oregon. Located on the peninsula formed by the confluence of the Columbia and Willamette Rivers, it has the atmosphere of a small town, family friendly with schools, jobs and services all readily available. St. Johns offers a downtown shopping district with eclectic shops, artist community, restaurants representing a diversity of cultures, and the beautiful waterfront park under the soaring bridge. The industrial areas along the rivers include cargo and shipping facilities and the Rivergate Industrial District. The most distinctive feature of our community is our famous bridge. Under this bridge is Cathedral Park, rated by BuzzFeed as one of the “22 of the Coolest Places to Get Married in America”. The St. Johns Bridge simply never takes a bad picture. North Lombard Street and Burlington Avenue intersect in the heart of St. Johns and mark the location of the St. Johns Plaza. Most businesses listed under Eat + Drink, Shop, and Services are within a few blocks and a short stroll from the Plaza. The Plaza at Lombard and Burlington is also where the St. Johns Farmers Market is held each Saturday in the summer months beginning on May 20th. 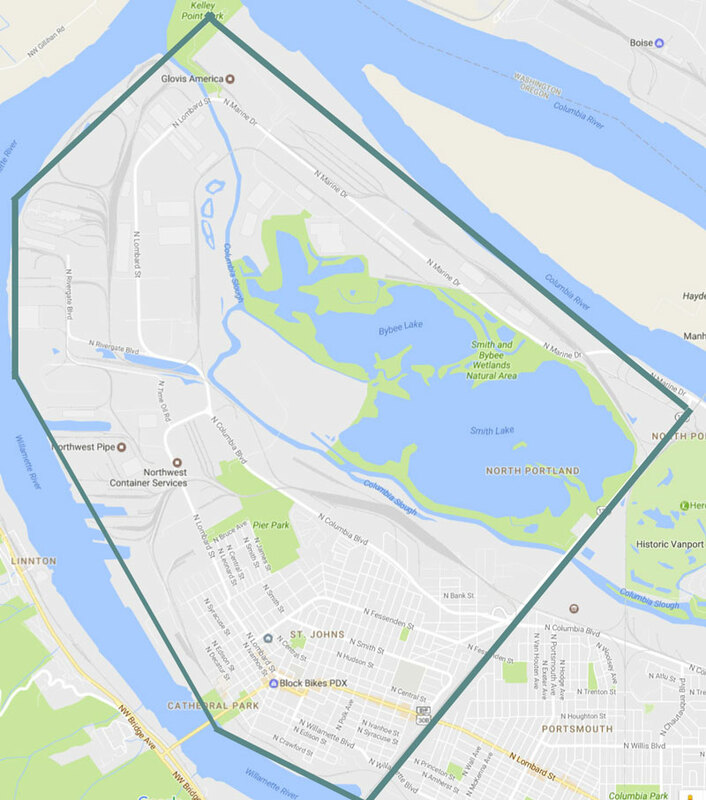 The St. Johns business district extends from the confluence of the Willamette and Columbia Rivers and east to the railroad cut. Enter your email address to subscribe. Know what is happening in the St. Johns business community. Where do you go for a referral? 6 Reasons to Call Your Insurance Agent! Proud Members of Venture Portland! Since 1986, Venture Portland has supported Portland's unique and thriving neighborhood business districts through grants, training and technical assistance. © 2018 St. Johns Boosters. All Rights Reserved.